Finally, Soho’s getting it right – those Pure gym bunnies aren’t into carbs and chipotle chilli after a gravity-defying asana session. 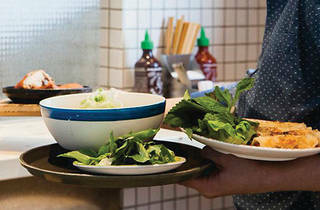 They’re much more likely to go for hip new eatery BEP Vietnamese Kitchen. 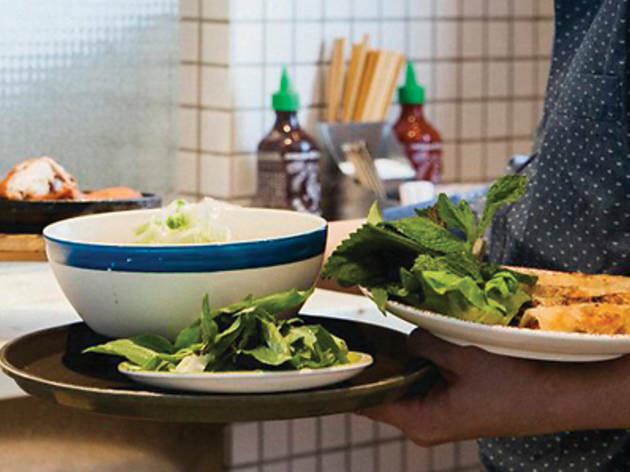 All clean, angular lines and white wood, the Nha Trang group-owned BEP serves up tall bowls of pho and other dishes found both on and away from the streets of Vietnam. Steering away from the typical pho tai ($68) – which we’ve heard is great anyway – we dig our chopsticks into bun rieu ($68), a rice noodle soup bowl indigenous to North Vietnam. Hearty chunks of mashed crabmeat and chả lụa come drenched in the mild tomato and garlic broth. It’s definitely a fishier option, but goes well with the generous side of Thai basil, coriander and beansprouts. We add a warm khoai lan nuong ($48) – gammy yam and sweet potato dressed with a hint of lime and coriander – to our meal, and that satisfies us. The portions are delightfully human-sized. The service is great – unfussy, not coated with all-too-familiar hipster superiority. Our only caveat is the sound quality. BEP is perfectly sized but has depressingly low ceilings, made apparent by the cacophony that arises from even the smallest smalltalk. If they could sort out the acoustics, this cheap and cheerful eatery could easily become a staple.